The Boys Brigade was founded in Glasgow in 1883 by William (later Sir William) Alexander Smith and companies soon began to be formed throughout the United Kingdom and, indeed, throughout the world. Its motto - "Sure and Stedfast" - summarises its objectives - "The advancement of Christ's kingdom among Boys and the promotion of habits of Obedience, Reverence, Discipline, Self-respect and all that tends towards a true Christian manliness". It sought to achieve this with an emphasis on military organisation, drill, discipline and uniform - a concept that was appropriate in that age and one that, though much modified, has survived to today. The origins of this organisation in Beeston date back to 1893 after which it continued to evolve, taking various forms and operating from a variety of locations over the next several years. In these early days, its Captain was Arthur Stephen Rogers, a hosiery manufacturer. He had married Ann Orton, daughter of John Orton, Beeston's surgeon who lived at the Manor House in Beeston and it was that connection that, no doubt helped when Rogers started a Bible Class for the membership, in the billiard room there. By around 1897, Captain Rogers needed to move to Nottingham to concentrate on a new direction in his career and turned to the younger members of his wider family for help in continuing this important work in Beeston. His eldest son, Ernest Strachan Rogers, was already involved in brigade work with 10th and 11th Nottingham Companies and might well have been ideal for the task, but his intention to train for the Ministry would mean that, apart from some more casual involvement, he would not be able to offer the commitment that was required. In the event, the task fell to a nephew, Stephen Strachan Rogers, then about 23, the eldest son of his older brother, James Henry Rogers. Stephen had moved from his parents' home in Stroud, Gloucestershire to Beeston, after school, to work in the leather trade, initially staying at his uncle's home - so his abilities were well known and thought appropriate to the task. Stephen was appointed Captain in 1897 and it was immediatly clear that the confidence that had been invested in him was well founded as he took on the task with new vigour and dedication. Meetings were well planned with no detail missed - as can be seen from the "Company Orders" that were publicised in the Beeston Times each week - the first we have, dated 4 October 1897, is shown here. As can be seen. 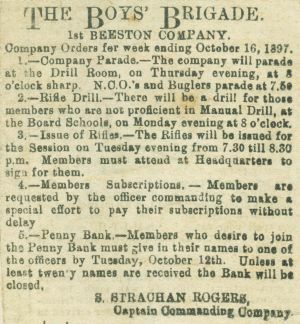 the Company was then known as the 1st Beeston Company and there was some kind of activity - drill, band practce, march outs, Bible classes, football, first aid and much more - on several evenings during the week. And there were new initiatives too - such as a penny bank, designed to teach thrift while helping the member to afford any special occasion. There was clearly a strong military element in both the organisation itself and its activities. This showed itself in the use of military terminology and ranks - including Officers, NCO ranks and Privates - the emphasis on drill and marching in Squads, Companies and Battalions and elements of the uniform - particularly the pillbox hat with chin strap which was then a feature of some military uniforms. Perhaps a particularly, strange feature by today's standards was the inclusion of rifle drill, albeit using imitation rifles - an element which was both popular and widely acceptable at the time but appears to have been dropped at Beeston - probably after the terrible losses of the Great War - long before the inclusion of guns was officially dropped by the Boys Brigade as a whole in 1926, following the amalgamation with the pacifist Boys' Life Brigade. In 1898, Stephen Strachan Rogers introduced an activity that was to become a firm annual favourite, one that was to continue over the years - the Summer Camp. While this would nowadays seem a fairly obvious fixture to consider, in the early years of the Boys Brigade, the idea of boys sleeping under canvas was not something that was easily accepted by parents. Happily, by 1898, these early reservations had been largely overcome and, during a week in July 1898, the first camp was help at Skegness. This was truly a chance, as the Brigade founder intended, for Officers and boys alike to participate together in the fun and activities, to work and eat together, an environment designed to guide the boys' character and behavior towards a mature adult life. The camp, attended as it was by 36 boys with 6 officers - including on this one occasion, Ernest Strachan Rogers who acted as Quartermaster - was an undoubted success. Click here or the image to view pictures taken during the week. In the following year, 1899, it was decided not to hold a summer camp. Nevertheless, regular activities at home continued as usual, including the development of a bugle band under Bandmaster Reddish. Towards the end of that year the Company's name of "1st Beeston" was dropped and the name "17th Nottingham" was adopted, presumably to fall into line with the organisation of Companies in the Nottingham area. This name continues to this day. In July 1900, the Company was again back in camp at Skegness - an event that was repeated in 1901 and 1902 while under the leadership of Stephen Strachan Rogers. In 1900 there were 6 Officers and 35 other ranks in camp taking part in a well-organised and enjoyable week. Click here or the image to see pictures taken during the week. In 1901, numbers increased to 11 officers and 50 other ranks but fell back to 1900 levels in 1902. Soon after its return from camp in 1900, the Company took part in a more long-standing regular event - the Annual Inspection, in fact, the fifth such occasion, this time held in the grounds of Chilwell Hall, when the squire, Lieutenant Geoffrey Nicholas Charlton of the South Notts Hussars inspected the Company. After drill and a march past, Lieutenant Charlton congratulated the Company on the excellence of the performance, stating that it reflected great credit on the officers. Somewhat prophetically as it was to prove, he remarked that if any of the boys thought of entering the army, the training they received would be very useful. After the parade, prizes were presented the Company enjoyed tea in the grounds and sports were played. Click here or the image to see pictures taken at the event. By that time, Rogers had been able to put together a strong group of officers to assist him. This included Lieutenants A Atkinson (probably Arthur, a lace draughtsman), Henry Alfred Brooks (a hosiery manager), John Bullock Collin (a clerk at Beeston Foundry), E Smith and Arthur William Todner Ebblewhite (a commercial traveller). Tragically, in May 1901, John Bullock Collin was to die suddenly, aged only 35. His burial in Beeston Cemetery was accompanied by a contingent from the Boys' Brigate led by Captain Rogers, the Last Post was sounded and his cap and cane were placed on his coffin. His passing was a huge loss to his family, his employer, the Boys Brigade and the community as a whole. In 1901, Ernest Strachan Rogers had been ordained as a Deacon in the Church of England and, in 1902, became a Priest. From 1902 to 1907 he was a Priest at St Luke, Millwall but, after further appointments, including a brief period as a Curate at St Pauls, Hyson Green, Nottingham. he decided to return to University in Bristol where he graduated as a physician and surgeon in 1927, practicising first as a ship's surgeon, then in Nottingham, and then returned to London where he practiced for much of the remainder of his life in the Brixton area. He died in 1972, aged 94, apparently unmarried. After Stephen Strachan Rogers left in 1904, the Boys' Brigade in Beeston was once again looking for a replacement leader and, once more it focussed on the wider Rogers family, this time the sons of Arthur Steven Rogers' youngest sibling, Laura Kate Rogers who, in 1877, had married Henry John Pearson, the co-founder of Beeston Foundry (later Beeston Boiler Company). The couple had three sons, Stephen Hetley Pearson, his twin brother John Strachan Pearson and his younger brother Noel Gervis Pearson. Each is believed to have had some involvement in running the Company during these interim years but, after John left for New Zealand in 1906, it was Stephen who took the initiative and was to substantially reorganise the Company. Having been an officer in Oliver Hind's highly successful Dakeyne Street Lads' Club in Nottingham, he set about bringing a similar organisation to Beeston. 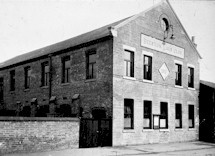 The Beeston Lads' Club, with a wide range of activities for boys - including gymnastics, games, band, first-aid and team sports - open every night with a weekly Bible class, all integrated into the regulations and principles of the Boys Brigade, followed Hind's formula in almost every detail. Summer camps were resumed too - click here or the image to see pictures of the 1912 camp. In 1909, Pearson opened a club room on the third floor of the Anglo-Scotian Mills, at the top of Villa Street. On the first night, 120 boys enrolled and its membership and that of the associated Boys' Brigade Company continued to grow dramatically over the next few years so that, by 1913 there was an urgent need for new premises to provide for a membership of 250. 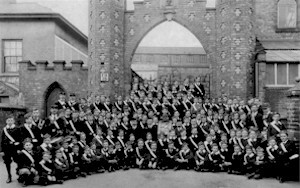 An idea of the strength of the membership can be seen in the photograph - above right - of the Company, taken in 1913 outside Anglo Scotian Mills. Click here or the image to enlarge and for more detail. Eventually, in 1913. a factory on Station Road - believed to be Emmetts lace factory - was acquired, helped substantially by the Pearson family. These premises, known as The Lads' Club, are shown here left. At around this time too, a sports field was acquired near the bottom of Dovecote Lane. In August of the 1914, almost immediately after the Company had enjoyed another summer camp, war came and the world changed for ever. At Beeston Lads' Club, with Stephen Hetley Pearson's active encouragement a contingent from the Lads' Club, mostly made up of members of its Old Boys Association, formed up and marched to the Nottingham Recruiting Office to enlist. The account of this and of the terrible loss of life that was to follow - which was to include the death of Stephen Hetley Pearson himself - is detailed here. Despite this terrible period - or perhaps even because of it - the Boys Brigade and Lads' Club at Beeston continued to grow in strenth and numbers. Over the years, a succession of excellent leaders built on the legacy put in place by the Rogers and Pearson cousins and continued to provide generations of Beeston boys (and later girls) with a firm foundation for life. And, the headquarters that had been established in 1913 with such confidence and forethought were later enlarged and were to remain the headquarters of the Company until they were acquired by developers in 2008, making possible a move to excellent, purpose-built premises on Nuart Road, where its excellent work with the young people of Beeston continues. 'Oliver Hind and the 2nd Nottingham Company of the Boys' Brigade' by Terence Woolley was published in 2013 (ISBN 978-0-9576599-0-2). It is a comprehensive and interesting account of how Oliver Hind combined the ethos of the Boys' Brigade with the excellent recreational and training facilies at Dakeyne Street Lads' Club in Nottingham. As we have seen, this became the model for the Beeston Lads' Club. It is very reasonably priced at £5.00, with copies available at www.nottinghambooks.co.uk. The account of the Stephen Strachan Rogers years has been assisted greatly by access to a photograph album and an album of newspaper cuttings of Company Orders and football match accounts which were put together at the time by Rogers. These remained with him until his death in 1962 and were then retained within the family. We are very grateful that his great-niece, Alison Hollingsworth, realising their local importance, has now kindly made them available.